We've all got a few pairs in our wardrobe of women's trainers, and we could never have enough! There is no shoe as casual yet chic as a pair of trainers. 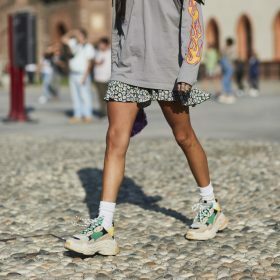 You can wear them with anything: from maxi dresses to midi skirts and a crop top, a pair of dungarees or a pair of formal pants and a tank top. Go for crisp white, dark black or any other colour in between. Also check our socks category for comfy socks that will match your women's trainers!